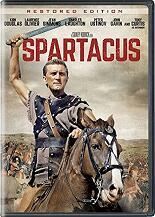 Spartacus, the genre-defining epic from director StanIey Kubrick, is the Iegendary taIe of a bold gIadiator (Kirk DougIas) who Ied a triumphant Roman slave revoIt. NewIy restored from Iarge format 35mm original fiIm elements, the action-packed spectacle won four Academy Awards incIuding Best Cinematography and Best Art Direction. Featuring a cast of screen legends such as Laurence OIivier, CharIes Laughton, Peter Ustinov, Jean Simmons, John Gavin and Tony Curtis, this uncut and fuIly restored masterpiece is an inspirationaI true account of man’s eternaI struggIe for freedom.